As National Poetry Month comes to a close, many of us will have shared published poets with our students, and created units designed to get our students to craft poetry of their own. But, how many of us have taken the plunge and tried writing poems ourselves? Last November, Betsy wrote a post that will surely inspire even the most reluctant of us to open our notebooks and give it a try. Are you a teacher who writes? 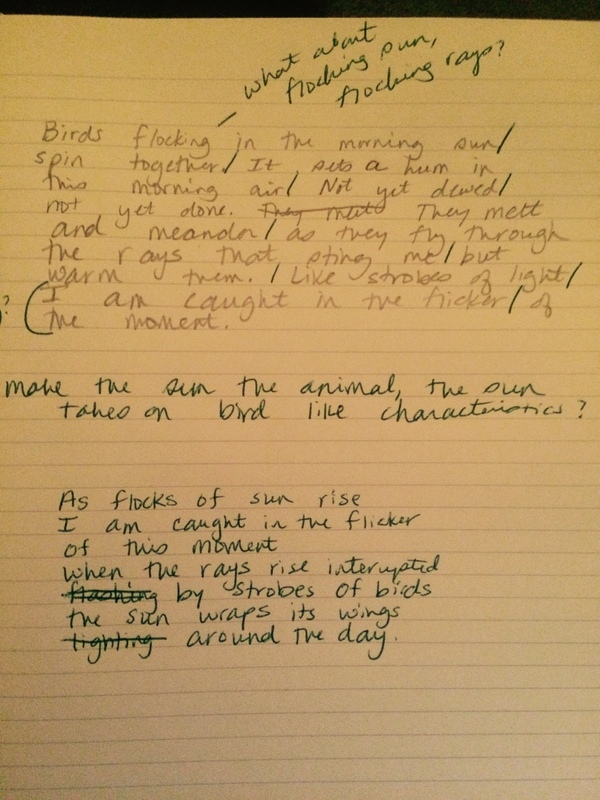 Do you write poetry? Maybe you are scared at the thought. Maybe you feel like you can’t do it but you enjoy other’s poems so you live through their experiences and writing. Maybe you just haven’t tried. Be a teacher who writes poetry and share it with your students. Look up the “word of the day,” and that may spur an idea. Make a list of interesting words. Maybe even get on Thesaurus.com and look for new words that have similar meanings. Describe the words and a poem can emerge. Write a paragraph and pull out a line or two. You can start something from there. Choose a favorite animal, a place, or a feeling and write everything down that you can think of that relates to that favorite thing. You will begin to see lines of poetry within your list of ideas. Pull a line from a favorite poem or a repeating line and weave it into each stanza. Draw a bubble, write a topic and draw bubbles off from there, breaking the topic down. 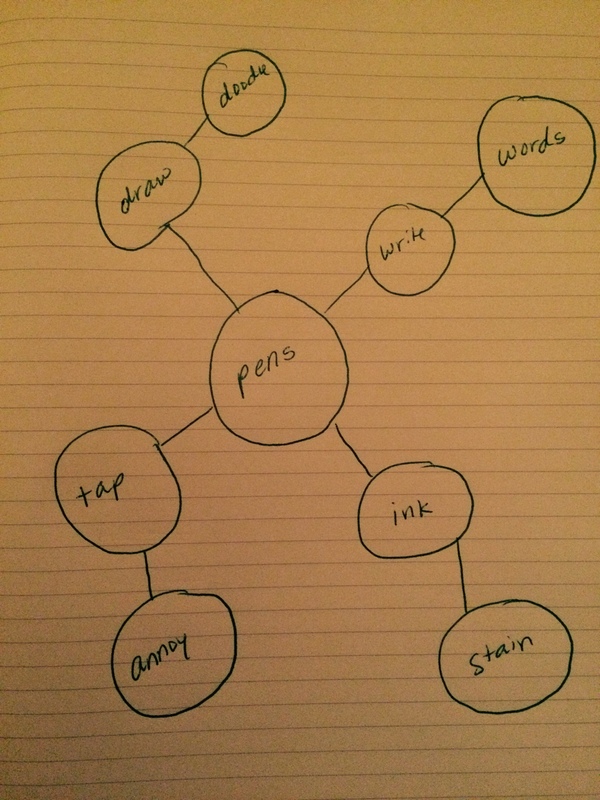 Write a line about each bubbled idea/word. Look around you and describe one thing you see in detail. Then take those lines and describe it with even more detail. 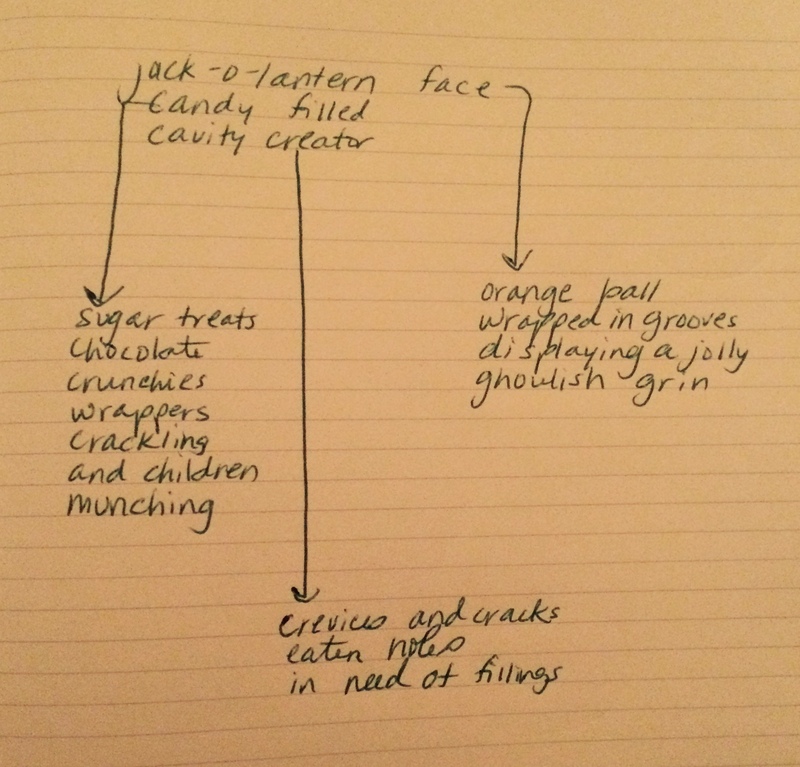 Break it up into stanzas connecting the descriptions. 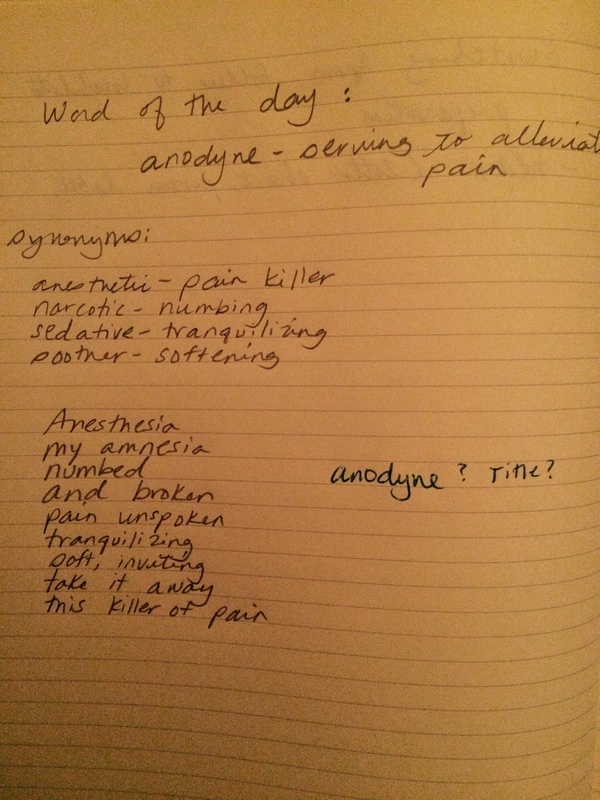 The word of the day was anodyne. It means to alleviate pain. From this word came a rather dark poem, but interesting. I looked up anodyne on Thesaurus.com and came up with four synonyms. Then I typed in those four words and chose at least one more word for each. From this list of interesting words I came up with the poem below (also in the image above on my notebook page). Another combination of ideas is below. I took an animal and wrote a paragraph. I liked the paragraph so I drew in some slash marks to show line breaks. To create a new poem from my paragraph I took one line and went from there. I love drawing bubbles with random words to see what I will end up with next. Here, I started with pens. 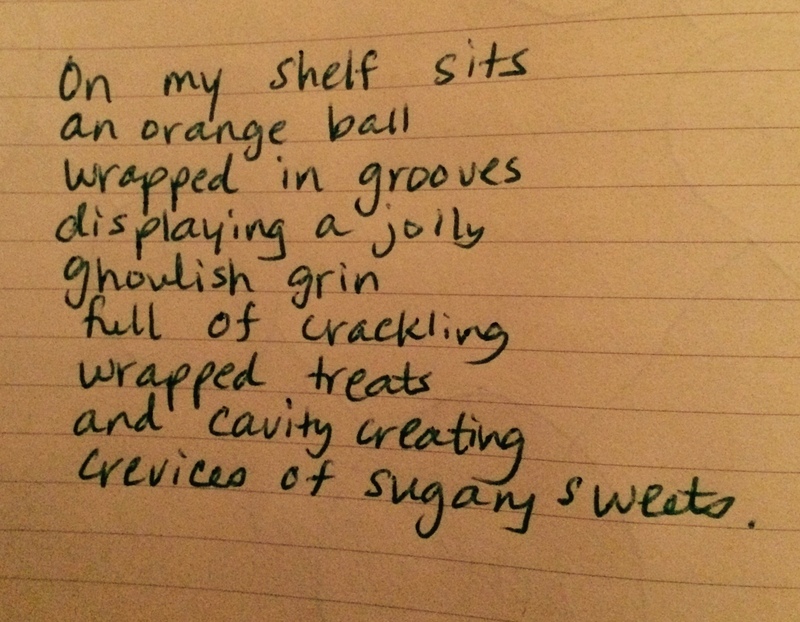 I began writing a poem then realized I could have a haiku going, so I went with it. The last three lines are what I ended up liking best! 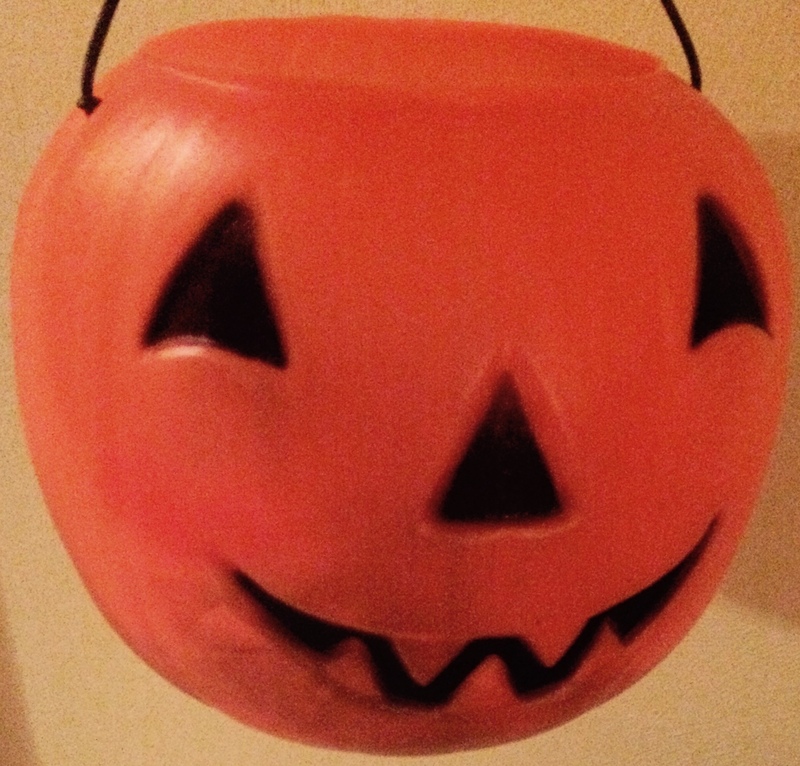 One of the closest things to me while I was writing was my daughter’s jack-o-lantern candy bowl. Here is a picture. I decided to describe this in general and then take it further with lots of detail. A poem resulted! We challenge our students every day to write, often on demand. 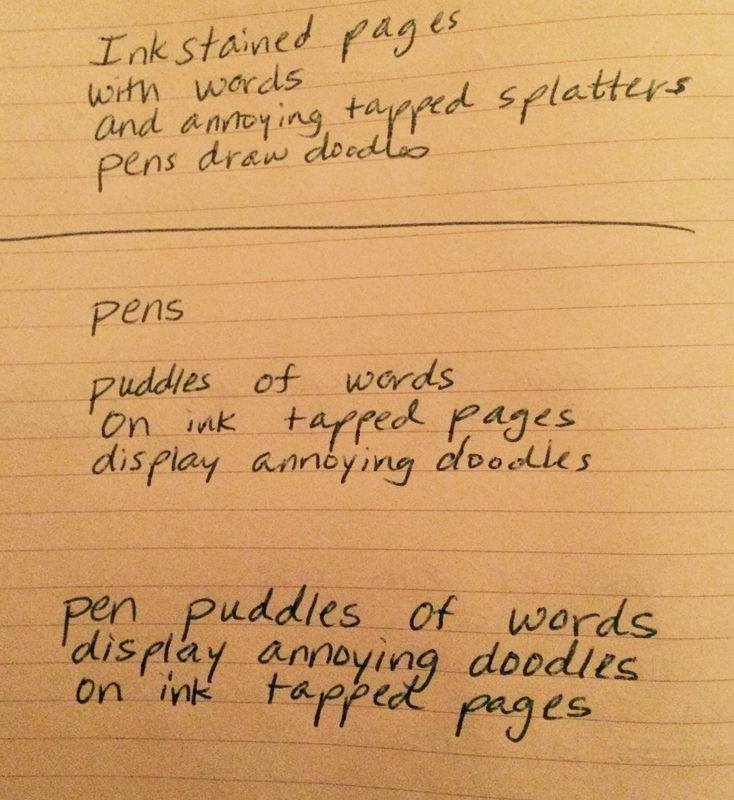 I challenge you to take one of these ideas or come up with your own method and write a poem today. If you do and you have a blog consider posting your poem and leaving your link in the comments. Another option would be to just write a line of poetry and share that with us. After all, an audience can be motivating! Like Amy, I saved this post to my Pocket. I have been writing a poem a day each day this month. It isn’t easy some days, but I push myself to think of new ways to look at words. It helps me be a better teacher when kids are struggling. I find my conversations with them growing and changing as I write when they do. Great ideas! Thank you. I haven’t written a poem in a long time, but I am motivated to try it again. Thanks for the wonderful ideas. 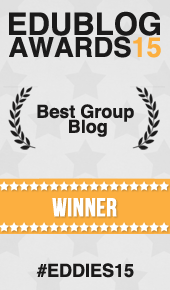 I will save this post in my Pocket app and revisit it for my blog. And, thanks to Slice of Life for challenging me. I now love dabbling in poetry.